Some great news to share – census refuser Jane Howarth had her court case dismissed last week after the judge declared that her court summons should have been for refusing to fill in the census, as required by law, rather than for refusing to answer a census officer’s questions, which Jane did in fact answer. I won on the fact that I was being summoned for not answering questions to a census officer but it was proven that [the] question I was asked I answered. The Judge said “that the summons should [have] been for refusing to fill in the census required by law” but the CPS and ONS had passed the time to summons me for that as a refusal was reported from my first visit, so by the time they issued a summons it could not be for this offence as the [allotted window] had elapsed. Even though it was reported I refused to fill in the census in August, that was deemed an answer to a question which had already been recorded back in April… Funny that the last minute skullduggery by the [Crown Prosecution Service] of the summons actually sealed their fate today. The government’s prosecution of census objectors is in jeopardy after a Birmingham man was granted a judicial review to challenge the legality of the act that makes it an offence not to complete the 10-yearly survey. Privacy campaigner Nigel Simons, who did not fill out the census, argues that section 8 of the 1920 Census Act conflicts with his right to privacy guaranteed by the European Convention on Human Rights. In his legal submissions, Simon points to the recent bid by US defence contractor Kellogg Brown & Root for the £1.5bn contract to run West Midlands and Surrey police. The US company, a former subsidiary of the Halliburton group, built the Guantánamo detention facility in Cuba. “These cases being dropped shows that there is a strong legal argument to say that conscientious objectors should never have been forced to associate with weapons dealers like Lockheed Martin in the first place,” said Walton. If you read up on judicial reviews, then you’ll find things saying they’re more for determining whether the process of a decision is valid, rather than the actual morality of the outcomes. That’s not what this one is about. This judicial review is about investigating the actual law, and whether it contravenes the EU human rights guarantees laid down in the European Convention on Human Rights. Deborah sent this through to us, and we thought we’d share it with you. Enjoy! I appeared at Reading Magistrates Court on Monday 14th May, to plead ‘not guilty’ to the charge of not sending in a completed census. To be clear, whilst I am guilty of not submitting the census – I have been compliant in my openness about my non-compliance – my ‘not-guilty’ plea is about the appropriateness of it being a criminal offence. Many of the answers are already available elsewhere. The Oxfordshire Observatory updates its statistics on residents every quarter, and the Office of National Statistics is just one of a number of sources. My experience as a City and County councillor suggests, particularly when money is tight, it is almost irrelevant where/what the need is: schools and hospitals will not be provided, they will be cut. ‘Need’ is easily redefined. A number of the questions were totally subjective in their content eg ‘How healthy were you in the last 6 months’; or bear no relevance to service provision e.g. your ethnicity/national identity. I was given time to put my case. I was asked by the prosecution how I knew that the data wouldn’t be used to provide services and suggested that it was for him to show me it was; that I had plenty of evidence for service cuts or stagnation. I also reminded him that it had been publicly acknowledged (by Francis Maude MP and Sir Michael Scholar of the National Statistics Authority) that the paper Census was costly and inefficient and that 2011 would probably see the last one. I rested my case on the fallacy behind the suggestion that Census completion is so important it overrides articles 8 and 9 of the Human Rights Act. The magistrate was extremely fair and even sympathetic. In her summing-up she referred to my non-compliance as ‘standing up and being counted in a different way’. But ultimately she felt obliged to rule by the letter of the law which states that a fine may be incurred for non-completion and return of the census. I am minded not to pay (£150 fine + £150 costs + £15 victim support fund). The Crown’s case against Judith Sambrook – for refusing to complete the 2011 Census – was formally dismissed at Shrewsbury Magistrates Court yesterday morning. This is the first not guilty verdict we’re aware of in relation to 2011 census refusers. The best part of this story is that the CPS tried to drop the case against Judith discreetly but – having none of it – Judith revived the case herself. She was forcing their hand, saying they had to produce any evidence against her. The hearing itself was over in a matter of minutes and the case dismissed when Andrew Warman of the CPS offered no evidence against her. Andrew Warman for the CPS offered no evidence against her. Only a small percentage of those who refused to complete their 2011 census forms in England and Wales were prosecuted. When the CPS has dropped prosecutions, they haven’t been forthcoming with reasons why, which just makes their decision to continue with other cases look even more disorganised, unfair and uneven. As mentioned in our last blog post, John Marjoram’s case was dropped because the CPS suddenly decided there was “not enough evidence to provide a realistic prospect of conviction” – even though there was the same amount of evidence as when it confidently initiated brought the prosecution. John Voysey’s case, which was briefly linked with John Marjoram’s to be dealt with jointly, was also dropped after John M’s case was discontinued. Other cases are still continuing, and only this week Deborah Glass Woodin of Oxford was found guilty of the same offence at Reading Magistrates Court. See our page on the ongoing court process for more info. Genny from No Concensus has kindly allowed us to adapt a piece she wrote into a three-part blog piece. The first was on why people refused, the second on the court process; this week, it’s the law surrounding census refusal. The Office of National Statistics, the government body responsible for the Census, reported that 400 cases of failure to complete the 2011 Census were sent to the Crown Prosecution Service with a view to prosecution. This is ten times more than 2001, with over 100 convictions so far. The conviction rate is perhaps unsurprising since there is no immediately obvious defence under the Census Act for failure to comply with the Census. Many Magistrates and District Judges seem to be of the opinion that Census refusers are guilty almost by definition. 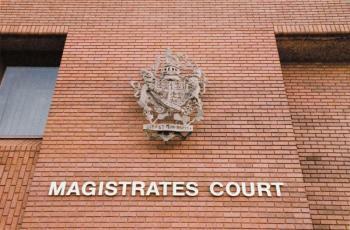 After the 2001 Census, around 40 prosecutions were brought with only one defendant found ‘not guilty’. But with a much greater awareness of Lockheed Martin’s and CACI’s involvement as well as concerns about data security and surveillance issues, this time things don’t look nearly so clear-cut. A number of cases are raising important legal challenges, helped by effective networking between defendants, supporters, support organisations, and legal advisers. Some of the arguments that defendants are using include that any conviction may breach their rights as enshrined in the European Convention on Human Rights. For example, being compelled to complete the census could breach the right to privacy, the right to freedom of conscience and religion, the right to self-expression, and non-discrimination laws. Questions are also being raised about the right of census enforcement officers to interview people about their failure to return the forms, as well Lockheed Martin’s obligation under the US Patriot Act to supply the US government with any data collected if requested to do so. There are also grave concerns about the general confidentiality and security (or not) of the information gathered under the Census and how cases are being selected for prosecution. Refusal by the Magistrates court in Liverpool to award legal aid to two defendants on the basis that they failed the ‘interests of justice’ test has been challenged by a Judicial Review in the High Court on behalf of one defendant, with the other an ‘interested party’. The High Court recently ruled in the defendant’s favour, paving the way for others to receive Legal Aid, although some people won’t qualify because they don’t meet the financial criteria. A number of lawyers and barristers have volunteered to help in these situations and are assisting with cases on a ‘pro bono’ basis. We are aware of ongoing census cases in Liverpool, Wrexham, Shrewsbury, Birmingham, Bristol, Reading, Barnstaple, Bury St Edmunds, Glasgow and Falkirk. It looks likely, on the basis of trial outcomes to date, that Magistrates and District Judges will return guilty verdicts on Census refusers although this should not be seen as a foregone conclusion. Defendants found guilty can appeal and these cases may eventually end up at the High Court which has greater powers to determine issues involving Human Rights Act compliance. One defendant in Liverpool currently has an appeal at the Crown Court and has been awarded Legal Aid for this, with a senior Judge appointed to hear the case on 4th April. In their entirety, these cases are undoubtedly of significant legal interest but, whatever the ultimate outcome in the courts, we owe a vote of thanks to all conscientious census objectors. Without their dedicated efforts, the unacceptable government practice of paying them large sums of money from the public purse to unethical companies would never have reached public attention. our nation and its people.” Glen Burrows, Rail, Maritime & Transport Workers Union. More in the Indymedia article about the success. Genny from No Concensus has kindly allowed us to adapt a piece she wrote into a three-part blog piece. Last week was on why people refused; this week, it’s what goes on for the refuseniks that are taken to court. Each census objector facing trial in the courts makes his or her own decision about how to deal with that situation. Not everyone wishes to continue their resistance through ‘not guilty’ pleas, entering on the possibility of high fines, costs, bailiffs and even a prison sentence for refusal to pay. Some people have opted to complete the Census at court so that the prosecution will be dropped. Others are pleading guilty. Some of those who either plead guilty or are found guilty after a ‘not guilty’ plea may refuse to pay their fines. Some are actively contesting the charges against them and mounting a variety of defences with or without legal representation. Whatever choices these resisters make during the legal process, we stand in solidarity with them all. Three solidarity networks are working alongside census refusers: No CONcensus and Count Me Out in England and Wales and Ethical Census in Scotland. These have been helping to publicise cases, offer information and support to those facing prosecution, attend court hearings and put census refusers in contact with one another. Vigils and demonstrations outside the courts alongside issues raised eloquently by defendants inside are gaining widespread media coverage and shining a big, bright spotlight on the murky world of arms companies. The media and the public are increasingly concerned about the activities of Lockheed Martin and CACI, as well as the surveillance state and the insecurity of confidential data, government support for unethical corporations. There are further concerns about the distance defendants are being required to travel to their hearings and the (mis)use of public funds to prosecute those who refuse to support such corporations. Is it really in the public interest to prosecute census refusers? Defendants and others have submitted numerous Freedom of Information requests in relation to various aspects of the 2011 Census and no doubt issues in relation to these responses will feature in defence arguments. The prosecutions even looks like they might backfire on the Office for National Statistics, Crown Prosecution Service, and Lockheed Martin by ending in a public relations disaster for all three. It seems likely that the ONS will very much regret the appointment of arms companies to run the census. Next week: the law on census refusal. UPDATE 08/03: 240+ people have paid towards Roger’s fine so far in two weeks – amazing! 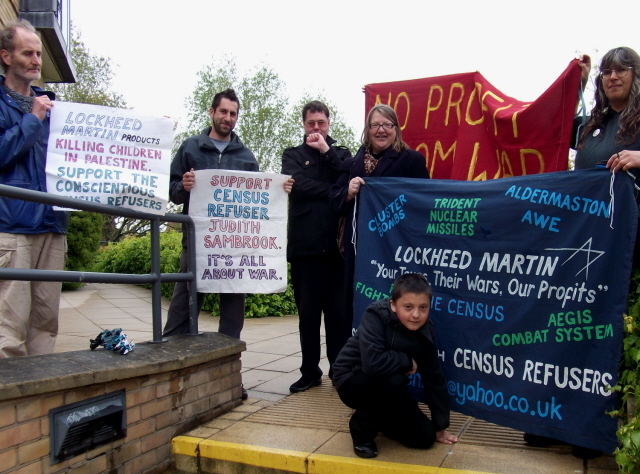 March 1st: Roger Franklin is an 84 year old peace campaigner and census refuser from Stroud. Last month, he was fined £460 by Bristol Magistrates Court, which he is refusing to pay for moral reasons. A solidarity payment campaign is running – all you have to do to take part is donate a tiny amount of the fine for him. Can you afford £2? The deadline is Wednesday 7 March to collect the £2. As of 1 March, the campaign had raised the magnificent sum of £159.33 in tiny cheques (some as low as £0.99). Write a cheque for £2 to HMCTS (HM Courts & Tribunals Service), and post ASAP to Monica Jones, ‘Wisma Mulia’, Bridge Rd, Frampton on Severn GL2 7HE for bulk mailing to the court. You can also send a statement of support which can be used for the media (another census-refusenik and Stroud resident, John Marjoram, goes for trial in May). Thanks to Monica Jones and Bristol Indymedia for the information!